Aging is a key risk factor for many diseases, particularly disorders of the brain like Alzheimer’s or Parkinson’s, which primarily occur in the elderly. So a better understanding of the aging process should provide a better understanding of these neurodegenerative diseases. The induced pluripotent stem cell (iPSC) technique makes it possible to grow human brain cells, or neurons, in the lab from elderly patient skin samples. Unfortunately, this method has a major pitfall when it comes to aging research: reprogramming skin cells back into the embryonic stem cell-like state of iPSCs strips away many of their old age-related characteristics. Based on data published last week in Cell Stem Cell, Salk Institute researchers used a different technique called direct reprogramming as a means to keep old cells old. This alternative method sidesteps the need to make iPSCs (which brings cells all the way back to the pluripotent state) and instead converts a skin cell directly into the desired cell type. 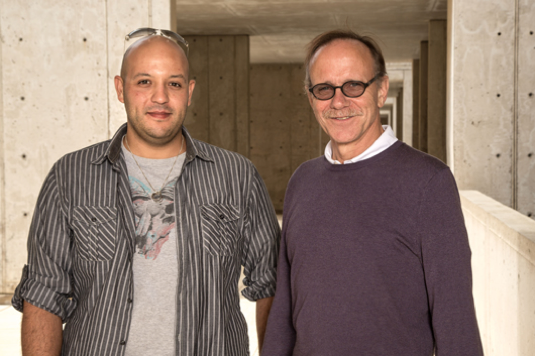 First author Jerome Mertens and senior author Rusty Gage (Courtesy of the Salk Institute for Biological Studies). The study, funded in part by CIRM, relied on skin samples from people ranging in age from newly born to 89 years. The team generated iPSC and iPSC-derived neurons from these samples. They also made so-called induced neurons (iNs) from the skin cells using the direct reprogramming method. Other CIRM grantees have pioneered direct reprogramming of skin into nerve cells (see link below). 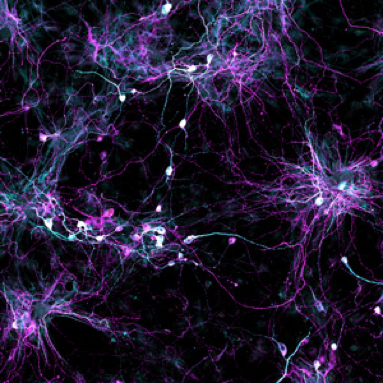 Skin cells from elderly human donors are directly converted into induced neurons (iNs), shown. (Image courtesy of the Salk Institute for Biological Studies). When comparing skin cells from donors younger than 40 years old versus cells from the over 40 group, the team found several genes had age-dependent activity patterns. Those differences virtually disappeared in the iPSCs and iPSC-derived neurons from the same individuals. However, unlike iPSCs, direct reprogramming of the skin cells to neurons (iNs) hung on to age-dependent differences in gene activity. A deeper analysis identified one gene called RanBP17 whose activity levels declined with increased age of the donor in both the original skin cells and those directly converted into iNs. 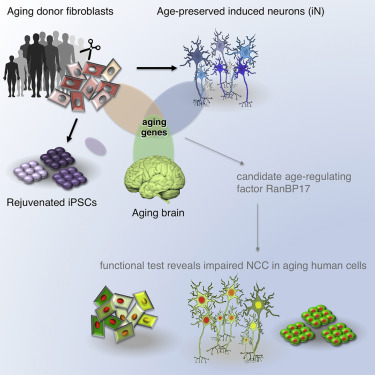 But when those same donor skin cells were turned into iPSCs or even iPSC-derived neurons, RanBP17 levels in the older cells were no longer reduced and were on par with RanBP17 levels in the younger cells. In follow up experiments, a reduction in RanBP17 protein led to glitches in the transport of proteins into the cell’s nucleus, which other studies have linked to neurodegenerative diseases as well as the aging process. By using this powerful approach, we can begin to answer many questions about the physiology and molecular machinery of human nerve cells–not just around healthy aging but pathological aging as well.